Preparing for the Zombie Apocalypse? Find the supplies you need to protect yourself from a zombie attack! Don't get bitten. That's the first, and most important rule. The zombie apocalypse doesn't have to mean your inevitable death. I have compiled a selection of products to help address all your protection from zombie needs, including home repairs, defensive tools, and zombie proofing. Lots of jugs of water - as many as you can store! Add in: Batteries, Flashlights, Dry Matches, Pot (for cooking or boiling water), eating utensils (plate, mug, spoon, fork), Rope or twine, Paper maps, Permanent markers (or pens/pencils to write with), Lighters, Camp stove and propane, Hatchet or axe, First aid book, Sunglasses (got to look cool! ), Duct tape, Glow sticks, Boots, Extra pants, Smartphone (with extra battery), portable water filters. Zombie assaults will create major chaos, both inside and outside your home, and you will need the following supplies to clean-up after. • Carpet stain removal - killing zombies can be a messy job. Who wants to live with all those blood stains on your rugs? • Patching Walls - Swinging that baseball bat or hatchet can result in a few holes in your walls. You don't want to leave any opening for the zombies to get back in, so start patching! • Window and screen repairs - Fuel may be scare and the power is probably out, so make sure to repair your broken windows or screens. No need to let the zombies in! • Regrowing trampled plants, flowers and lawns - You may not be in Homes and Gardens any longer, but who doesn't appreciate a pretty garden. Don't let the zombie horde trample your garden and lawn! • Cleaners and Detergents - After dragging those zombies out of your house, clean-up left-behind stains and wreckage with your stockpile of heavy-duty cleaners and detergents. • Automotive tools and accessories - The Undead don't care if you're covered for automobile or property damage! You are going to have to fix it all yourself so be prepared, with everything from auto tools to body repair to cleaning. You probably have many of these multipurpose tools already in your home. Not only can you use them for routine home projects and maintenance, but they can be very effective when defending your family and home from zombies and other invaders. • Nailguns, Sledgehammer, Shovels and Pick Axe - Destroying their brain is the only surefire way to neutralize the zombie, and these tools will do the job nicely. • Gloves and Protective Gear - You need to protect yourself during a zombie outbreak. In a perfect world, zombies would never get within biting range. But because it can happen, you will need protective gear. • Power and hand tools - Any hand or power tool you have can be used to repair your home, and in a zombie assault! You should always be prepared to grab the most essential tools in your shop before taking cover. • Chain Saws and Hand Saws - Keep your hand saws sharp and your chain saws fueled, because you are going to want to clear away any hedges blocking your view of on-coming zombies and attackers. • Tool Chests - With your zombie tools-of-defense organized and accessible, you will be ready to protect yourself and your family at a moment's notice. Avoid the zombie hordes altogether by fortifying your home against the undead. • Nails, Screws, Bolts and Fastener - Nail it, screw it or bolt it? What is the best type of fastener to use when covering your windows with planks of wood? • Door Locks and Deadbolts - Once you have made sure your home is tough and durable, be very picky about your locks. The best suggestion are dead bolt locks. It really is the best kind of lock to keep out the undead, and remain one of the survivors. • Alarm Systems - You could use a string of tin cans, or better yet, one of these systems to alert you to oncoming zombies. • Power Generator - Converting fuel to electricity with a power generator can mean all the difference to your survival during a zombie apocalypse, because without your hot cup of coffee in the morning, is life really worth living? • Face Masks - In the event your zombie neighbors begin to smell, battle the next-door stench with these face masks. Get one for everyone in the family! • Zombie Survival Food - The 'Just in Case' Food Supply: Survival Tabs for zombie situations. Compact design allows for easy storage when you are on the run! • Zombie Munch Apocalypse Survival Trail Mix - Every day in the rat race can feel like a zombie apocalypse. It's all about survival, and this is just the snack to help you keep up the fight. • Zombie Survival Kit - Fun Box of Zombie Themed Stress Relievers. Great Care Package for the Zombie Obsessed. 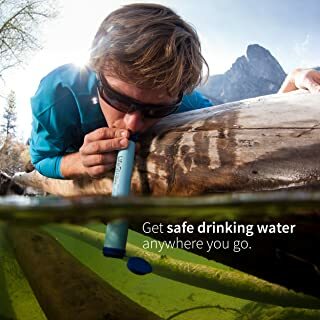 • Emergency Survival Water - Emergency purified water for immediate use; lightweight and extremely compact. • Sunflair Mini Portable Solar Oven - World's lightest and easiest solar oven; floats and dries quickly; folds to the size of a laptop; perfect for the zombie apocalypse.